Rembrandt Prodigal Son was created in1662 and now in Hermitage Museum, St Petersburg. The Return of the Prodigal Son, the subject comes from the Bible. Artist Rembrandt had already turned to the theme several times in his graphic works, but in the Hermitage painting, created not long before his death, the painter endowed it with the sense of great tragedy elevated to a symbol of universal significance. Complex emotions are expressed in the figure of the bent old man and his suffering, kneeling son: repentance and charity, boundless love and regret at the belated spiritual awakening. Rembrandt Prodigal Son is one of his most popular works. 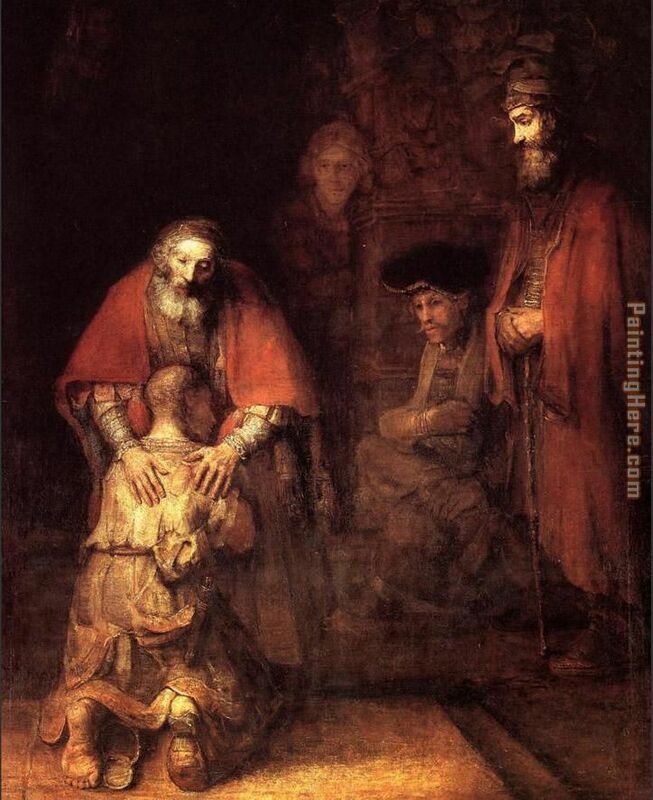 You can custom a 100% handmade reproduction of Rembrandt Prodigal Son Painting here! Beautiful, original hand-painted artwork in your home. Interpreted paintings based on the masters' works of Rembrandt.This The Return of the Prodigal Son needs about 14 - 16days for production by a talented artist. If you're not happy with Rembrandt The Return of the Prodigal Son that you made on PaintingHere.com, for any reason, you can return it to us within 50 days of the order date. As soon as it arrives, we'll issue a full refund for the entire purchase price. Please note - PaintingHere.com does not reimburse the outgoing or return shipping charges unless the return is due to a defect in quality. If you want to purchase museum quality The Return of the Prodigal Son at discount price, why not give us a try? You will save a lot more! This Rembrandt The Return of the Prodigal Son needs 14 -18 days for production time frame. We ship all over the world. We can provide The Return of the Prodigal Son Painting stretched canvas and large framed art.